May 2009 fish Decoys Net Carver of the Month. Tim was selected for this award because of his continuous involvement with Fish Decoy from carving and painting wonderful decoys, but his involvement in the organizations and shows supporting the fish decoy carvers. In 2005, Tim won his 3rd consecutive World Championship of Folk Art Fish Decoy carvers in Monroe Michigan. His decoys are featured in the collector’s reference book “Fish Decoy Makers Past and Present” and on various limited edition prints. He was featured in a special interest segment of the Antiques Road show. Tim Spreck of Stillwater, Minnesota He’s been a collector and dealer of fine fish decoys and antiques for many years. Tim’s fish stand apart with their abstract art style. This style has made him quite popular. While using a modern day slant on the traditional fish shape his fish show a bright and very detailed paint scheme. 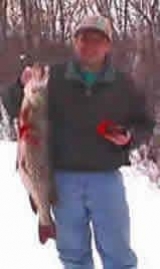 Tim maintains a very large website of fish decoys and a good source of information. Tim’s decoys are readily identified by their style.